Vitaslim FITNESS is the purest L-carnitine in the world – it contains L-carnitine Carnipure™ by Lonza, and is the most powerful natural fat burner. Vitaslim FITNESS speeds up fat burning and supplies the human body with energy. Vitaslim FITNESS helps you achieve remarkable results due to the L-carnitine in liquid form (patented Licaps® technology by Capsugel). Encapsulation protects its unique qualities up until the moment of absorption in the human body. 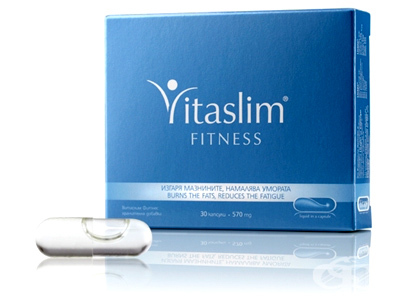 Firm and Shapely Body: Vitaslim FITNESS burns fats quickly and effectively. It speeds up exertion of toxins through perspiration, and energizes the human body by delivering oxygen to muscles, thus helping it become firm and good looking. Physical Exercise without Muscle Fever: Physical exertion and exercise unfold the full potential of Vitaslim FTNESS. It makes muscles more durable and speeds up their recovery after physical exercise by preventing muscle fibers from tearing. Vitaslim FITNESS fights muscle fever by preventing the formation of lactic acid in muscles. It transforms fats into muscles, thus shaping up firm and good looking body. Vitaslim FITNESS supports blood flow and brain functions, it increases the energy in immune system cells, and supports healthy heart functions. The product is particularly beneficial for elderly people and vegetarians, as their bodies lack L-carnitine.